Situated in South Goa, it is a gorgeous three kilometre stretch of relatively pristine beach. A typical scene at this beach while on your walk includes fishermen hauling in their often plentiful catches, tourists jogging, yogis practicing their asanas(yoga acts) and others going for long swims in Arabian sea. Just five kilometres south of the idyllic Kola beach and ten kilometres north of the busy Palolem beach, Agonda beach is perfectly located in that it is a quiet haven when you need it to be, but also a short drive to the activity of the hub of south Goa, Palolem beach. 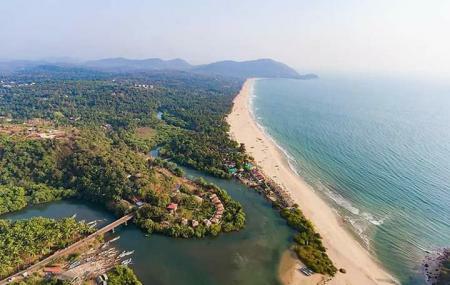 The Agonda beach has also bagged the ‘best beach’ in India award along with other beaches like Palolem, Radhanagar beach in the Andaman and Nicobar Islands, Mandrem and Cavelossim in Goa. The Agonda Beach also offers cosy huts and bungalows on rent that are perfect for accommodation. Sunbathing, relaxing and swimming are some of the popular activities on Agonda beach. The next time you plan a trip to Goa, do not miss out on this lovely bounty of nature! Rent a car or a two wheeler. How popular is Agonda Beach? People normally club together Cavelossim Beach and Palolem Beach while planning their visit to Agonda Beach. This is the best beach in South Goa. Calm, peaceful, beautiful, less crowded, good options to stays, nearer to palolem beach. The beach is isolated but yet you will find most of the foreign tourists here. The shacks are beautiful and cheaper. The food options are very good here. Nearby area is beautiful. You can just relax here. Although, you will find party options as well. Only 5-6 km from Palolem beach, Agonda is ideal for fun filled beach experience. Wooded hills and rocky topography enhanced its beauty. Can take sun bath on the beach or can take a bath in the sea. There are endless greenery around Agonda. You can stay either in a sea facing beach front cottage or in the near by village. Peaceful environment will make your stay memorable. Hire a bicycle and explore the pristine beauty of the mother nature. Quite serene and beautiful. This beach is a paradise. It is in South Goa. The beach is famous among foreigners. There are many cottage houses facing the beach. You can spend the whole day there. Beautiful beach. Not much crowded but lacks few basic facilities but that doesn't matter. Visit at sun set for best view and pictures. Beautiful clean serene pristine beach with near blue sea and decent sparse crowd. No dearth of shacks and food joints either. A sure recommendable place to check in if you're roaming around South Goa.